Hey, y'know what would cheer me up? A good old fashioned caption contest. So here's a panel from Showcase Presents World's Finest. 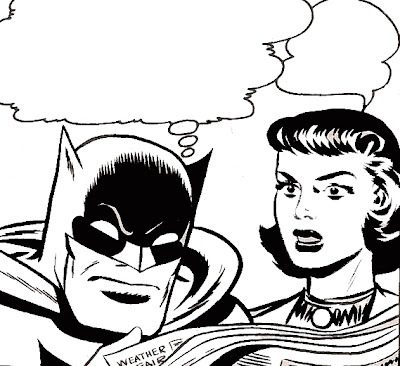 I think the possibilities for what Batman is thinking and Lois is saying are endless. Fill in the blanks and post it on your own blog with a link in the comments section here. Or, if you don't have a blog, just type out the dialog in the comment section. The winner gets a copy of the recently re-published Nexus The Origin comic, signed by Steve Rude, courtesy of Strange Adventures. It's certified and everything, so you know I didn't just write S.Rude on a comic. Alright! Get to work! Make me proud!